In order to keep your cat safe throughout the year, we compiled some helpful tips to avoid some specific season related dangers. Be mindful that while lilies are beautiful, they are highly toxic to your cat and other pets. Parasite Prevention – Parasite control is an integral part of your cat’s wellness program and year-round preventive care is essential. Fireworks – Leave your cat inside if fireworks are being set off outside. Keep your cat far away from any loud noises that might cause him stress. Hot weather – Help your cat stay cool during hot weather and make sure there is plenty of fresh, clean water available. Noise – Close all windows and shades to decrease the amount of noise coming from outside. If you are expecting guests, you might want to keep your cat in a location with less noise and traffic. You may calm your cat by playing background noise from a radio or TV in the area where your cat spends most of his time to reduce stress. Stress – Remember to stay calm and provide a safe place for your cat to hide in or behind, or use a feline facial pheromone diffuser/spray to reduce the effect that loud noises may have on your cat. When you are having company over, keep your cat away from the door. Your bell will be rung and door will open and close with strangers coming into your home. This can be scary for our furry friends. Place your cat in a secure space away from the front door to keep him calm and prevent him from darting outside into the night. Candies are not for cats. Chocolate in any form can be very dangerous for cats. In addition, candies containing the artificial sweetener xylitol, can cause major problems. If you suspect your cat has ingested something toxic, call your veterinarian or the ASPCA Poison Control Center at 888-426-4435 immediately. Use caution with any holiday costumes. Not all cats want to dress up, so your safest choice for a costume is a small loosely tied bandanna or festive collar. If you choose to fully dress up your cat, think simple. Cats can become tangled in costumes with strings, ties, belts, and sashes. Avoid costumes that restrict movement, vision, or breathing. Take off anything that is dangling or hanging so your cat doesn’t swallow it. Keep a close eye on your costumed kitty at all times. 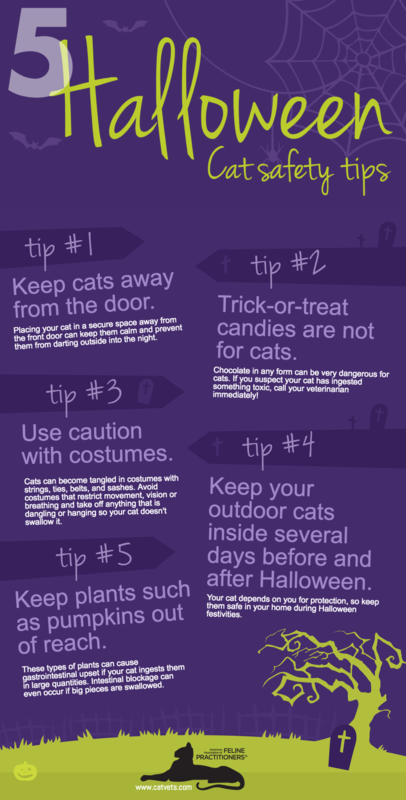 Keep your outdoor cat inside several days before and after Halloween. While black cats are commonly associated with Halloween, it is best to keep all cats away from risk of pranks or other cruelty-related incidents. Your cat depends on you for protection, so keep him safe in your home during Halloween festivities. Make sure fall plants such as pumpkins and corn are out of reach. Although they are relatively nontoxic, these types of plants can cause gastrointestinal upset if your cat ingests them in large quantities. Intestinal blockage can even occur if big pieces are swallowed. Dangerous Wrapping – Your cat might enjoy playing with the wrapping paper, but keep the bows and ribbons away from him. If your cat ingests the ribbons, they can become entangled in his intestines which will require surgery. If left untreated, your cat could die. Hanging Ornaments – Keep ornaments out of reach of your cat so he is not tempted to swat at them. Ornaments are not made of materials that can be nibbled on or ingested by your cat. Poisonous Plants – Mistletoe, amaryllis lilies, and paper whites are poisonous to your cat. Poinsettias will give your cat an upset stomach. 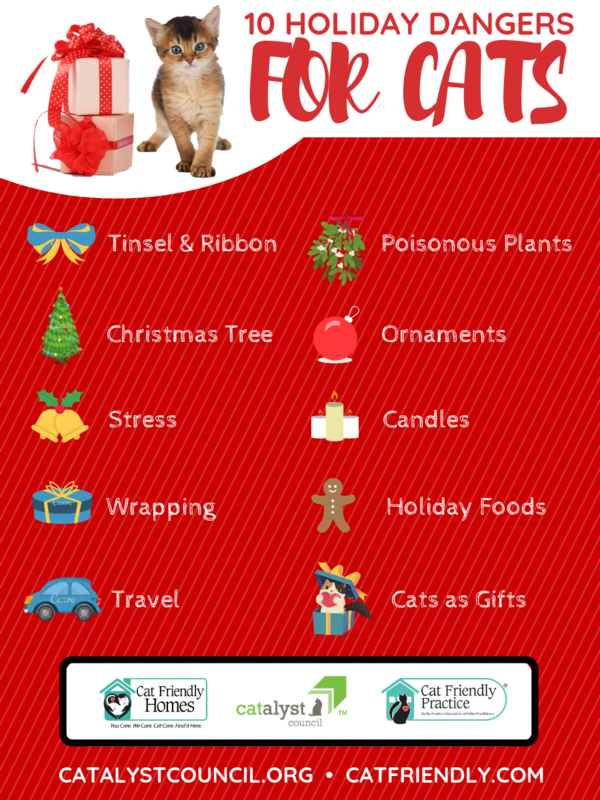 If you choose to have any of these plants in your home during the holidays, ensure they are kept out of reach of your cat. Candles – Be cautious of where you set a lit candle. Make sure it cannot be accidentally knocked over by your cat causing harm to him and your home. Holiday Foods – Don’t risk upsetting your cat’s stomach or greater harm by “treating” him to your favorite holiday food. Instead let him indulge in a cat treat approved by your veterinarian. Stress – Having guests over can cause stress to your cat if it is disrupting his regular routine. You can keep your cat away from the noise and traffic when you have guests over by keeping him in a separate room for a little while. Make sure he has all he needs: litter box, food, water, sleeping place, and toys to play with in this retreat area. Tinsel & Ribbon – If your cat ingests tinsel, string, or ribbons, it is life-threatening. Many times if your cat swallows a linear foreign body (non-food object) it does not pass through in the feces and your cat will need surgery to remove the item. So, consider skipping the tinsel and ribbon in order to keep your cat safe. 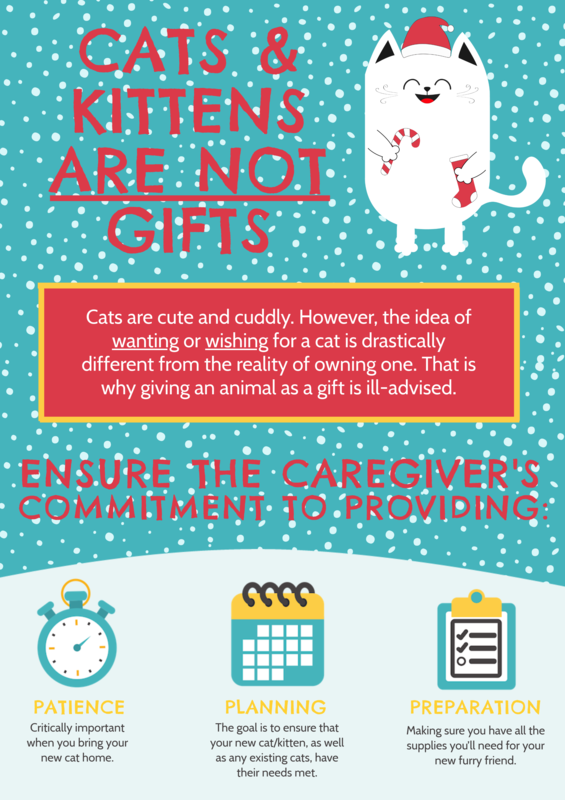 Cats as Gifts – Only give a cat as a gift if the recipient wants and is prepared to take care of this new cat. It would be heartbreaking and harmful if this poor cat was surrendered to a shelter because he was unwanted or the recipient was unprepared. Christmas Tree Water – The water that keeps your tree moist during the holidays is not safe for your cat to drink. Often trees have chemicals on them and this cat make your cat sick. Make sure you restrict your cat’s access to the Christmas tree water to prevent any accidents. Travel Dangers – If you travel with your cat, make sure you have an appropriate carrier that is safely secured in your car and proper identification in case you get unintentionally separated.